Today is National Coffee Day! With a blog called Fueled by Clouds & Coffee, how could I not make my favorite coffee shop my sketching destination on this drizzly, overcast day? 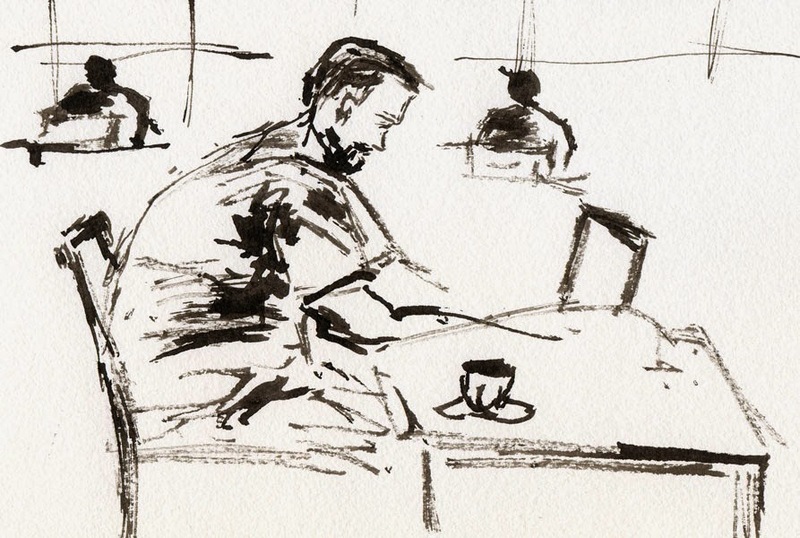 Settling into my favorite table at Zoka Coffee, I was feeling rusty; I hadn’t sketched in a coffee shop since April. 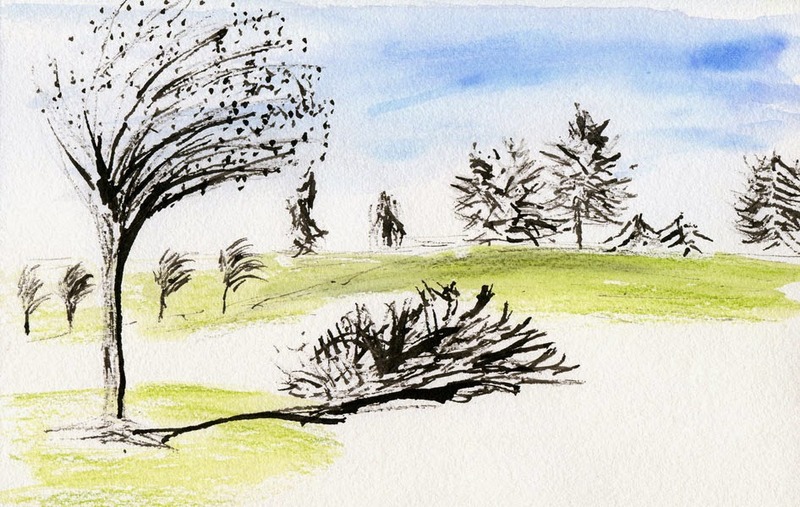 I decided to warm up with a couple of sketches using a twig and India ink. KK’s technique is starting to grow on me. When I sketch people, I tend to focus on the details of their faces and stances, and it makes for great life drawing practice. But working on facial details can also make me lose sight of strong values. My twig, as slender as it is, won’t allow me to scratch in any level of detail, so I’m forced to see and sketch only the darks and lights plus some texture. It’s a different kind of practice that I’m starting to really enjoy. That done, I took out my favorite Sailor pens and went for the kind of sketches of people that can put me in the zone immediately. 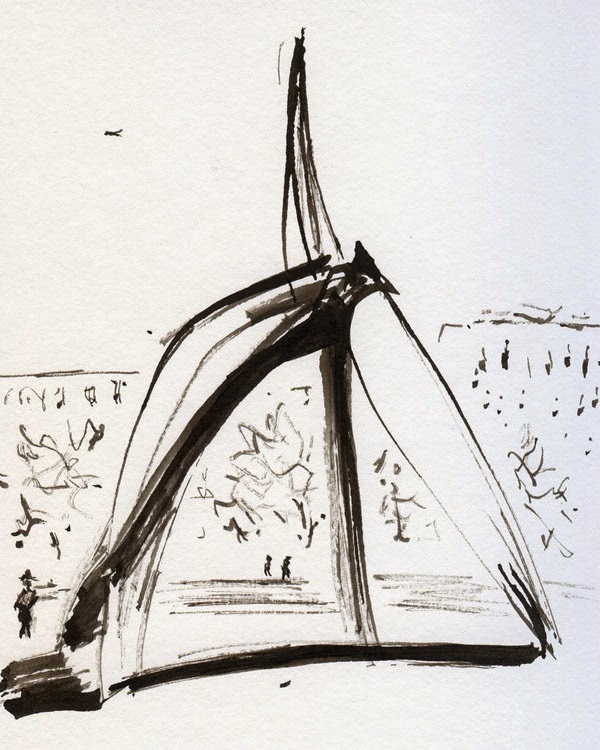 I’m sad to see summer’s sunshine and outdoor sketching weather end, but today is as good a day as any to celebrate going back to Zoka for more than one kind of fix. 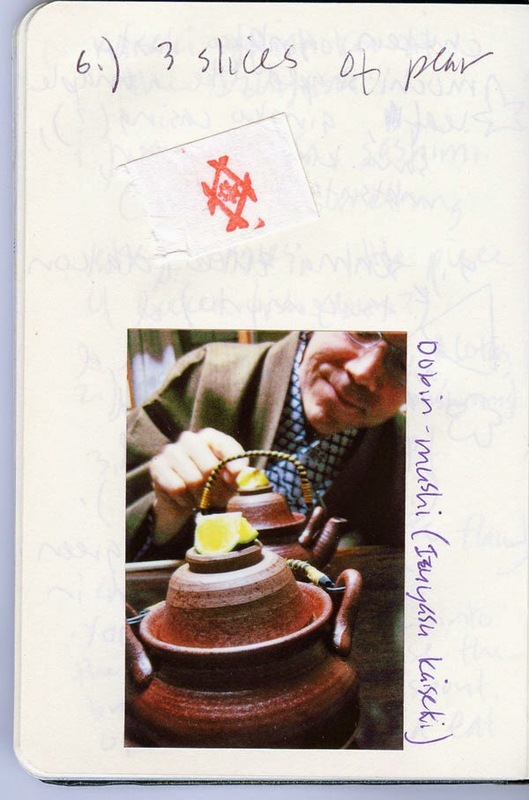 A few days ago I promised I would soon reveal the purchase I made at Kyoto Arts and Antiques. Ta-da: It’s a Japanese “shop box” (according to the tag) from the 19th century. You may recall that about a year and a half ago, I found a Hello Kitty Pez dispenser set/lunch box for my (then) manageable ink collection. As you might guess, my collection almost immediately outgrew the box. Since then I’ve been using a variety of plastic storage bins, which are serviceable but not esthetically pleasing. I wanted something functional yet interesting – something with a little history and character. I’m not an antique collector or shopper, but for the past year and half I’ve had my eye open for a box, small cabinet, set of drawers or something else that would be “just right.” My criteria for “just right” included a reasonable price, modest overall dimensions to fit in my small studio and, most important, the right interior dimensions to accommodate my collection of elegant yet relatively tall bottles of Pilot Iroshizuku inks. well-used by a kindred spirit. Finally last Thursday I found it: a small chest that fits well in my studio and has drawers just deep enough to hold all my ink bottles (with some room to grow! But fortunately, not much). 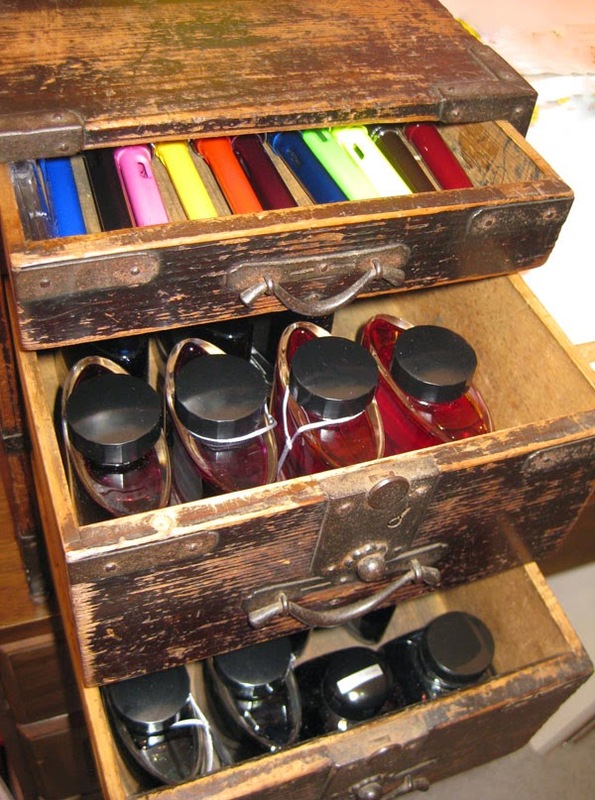 What’s more, the shallow top drawer is just right for my fountain pen collection. The finish is substantially worn and the top handle is missing, giving it wabi-sabi appeal (as well as an affordable price). Bonus: All the drawer interiors are ink-stained! 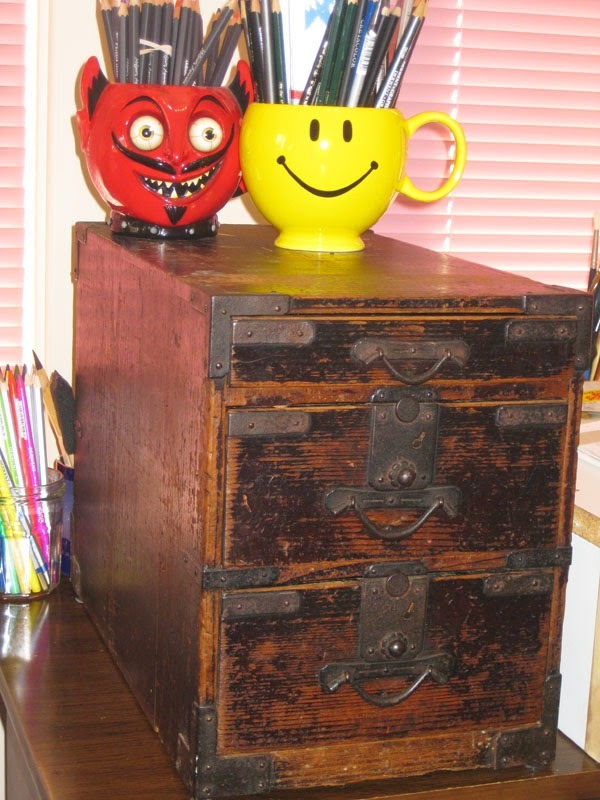 This “shop box” was once used by a kindred spirit to hold ink, brushes and pens. 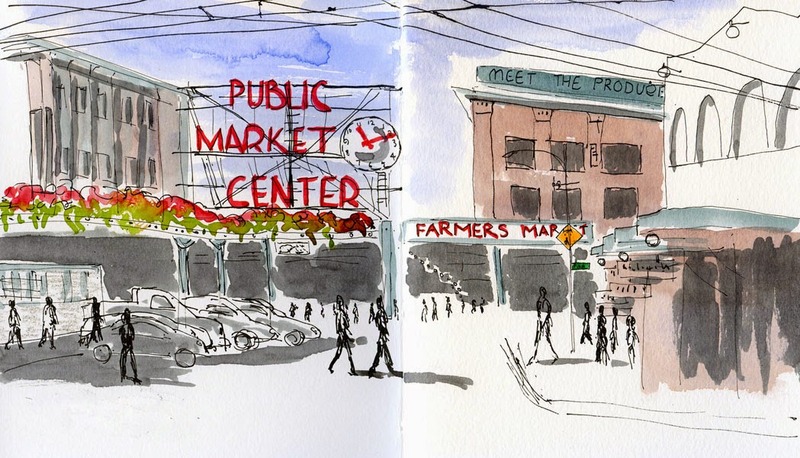 As much as I love to shop and sketch at farmers markets, I don’t spend much time doing either at Seattle’s most famous one – the Pike Place Market. 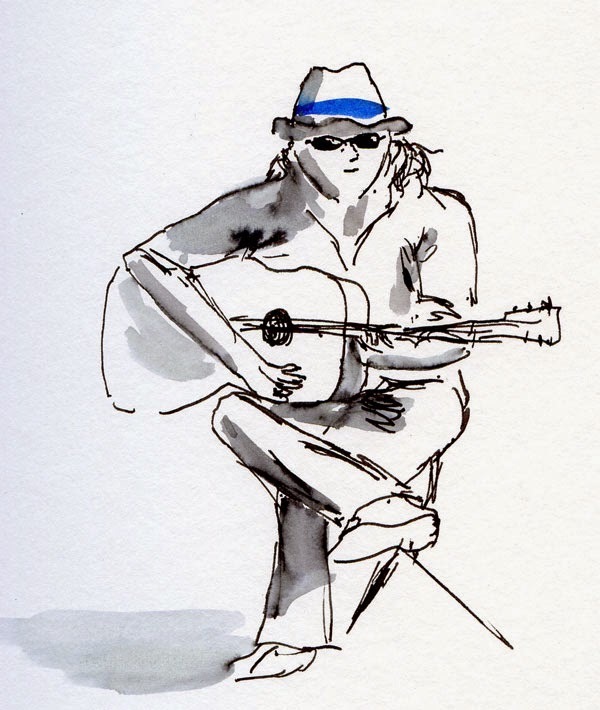 When I go there, I’m usually playing tour guide to out-of-town guests; if I have time to sketch there, I tend to focus on buskers. 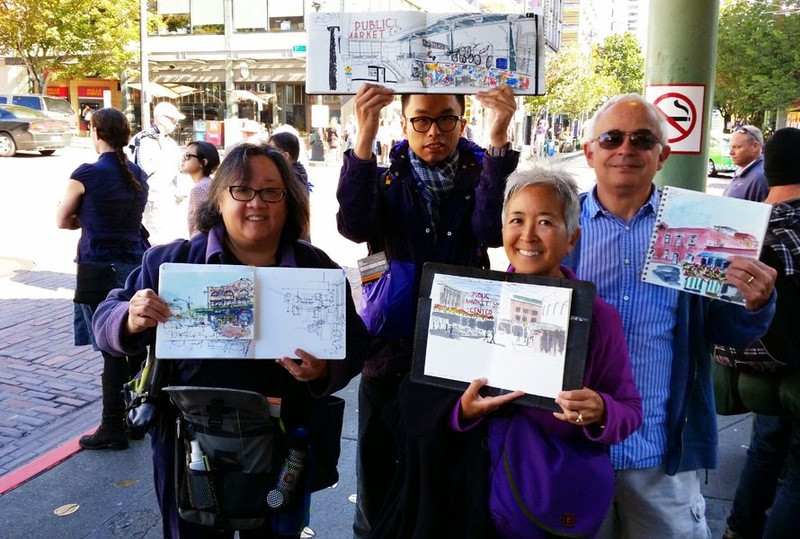 The first time I dared to sketch the iconic, overly-photographed Public Market Center sign was more than a year ago when I was there as part of Gail Wong and Frank Ching’s “Line to Color” workshop. 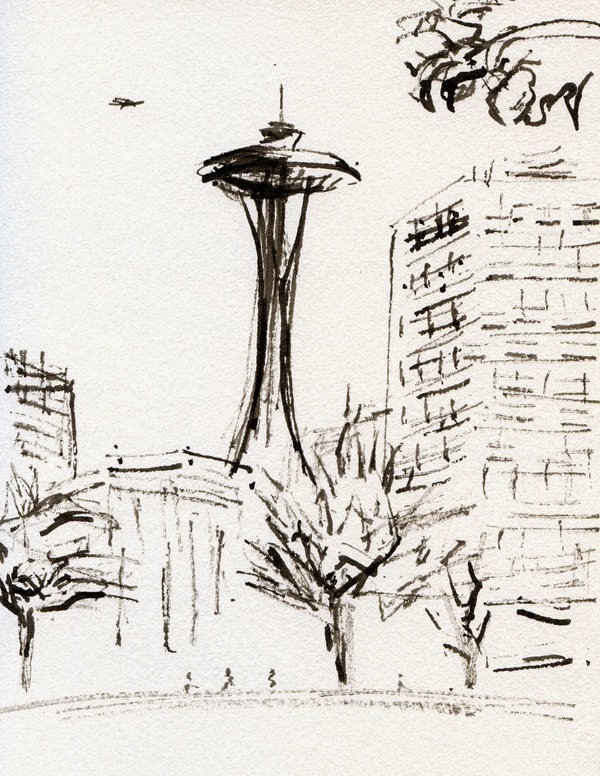 Sketching well-known sights is intimidating; standing on a busy street corner to get that view makes it all the more difficult. But that bright blue sky behind the clock was too much of an invitation to ignore. 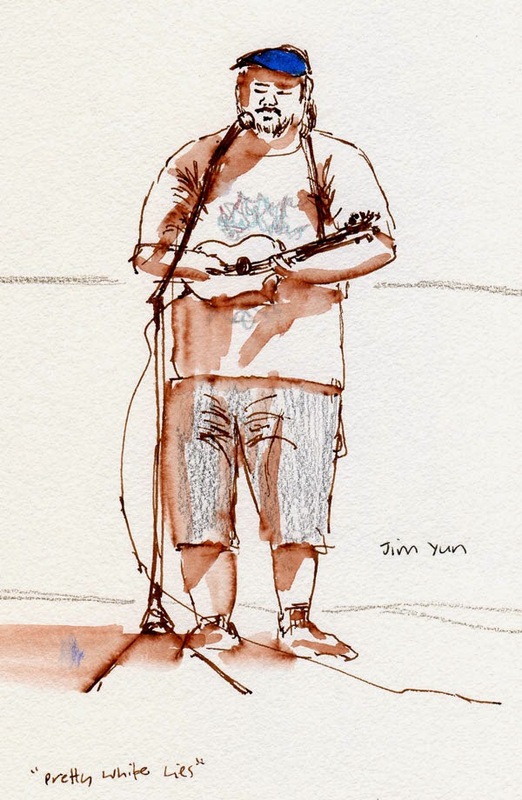 Best wishes to Ben Luk, urban sketcher from Hong Kong, now on his way to his next sketching destination! If you have any interest in Asian (mostly Japanese) antiques, you might want to check out Kyoto Art and Antiques, which is open to the public through Oct. 5 for its warehouse sale in Georgetown. These semi-annual sales last for only about 10 days each. Although I’m generally not an antique shopper, I’ve had something specific in mind for a while. When I went to Kyoto Art’s sale last spring, I saw lots of interesting antiques, but not quite what I was looking for. Today I spotted this large devil-like stone sculpture dated 1773 (with a price tag of $510). 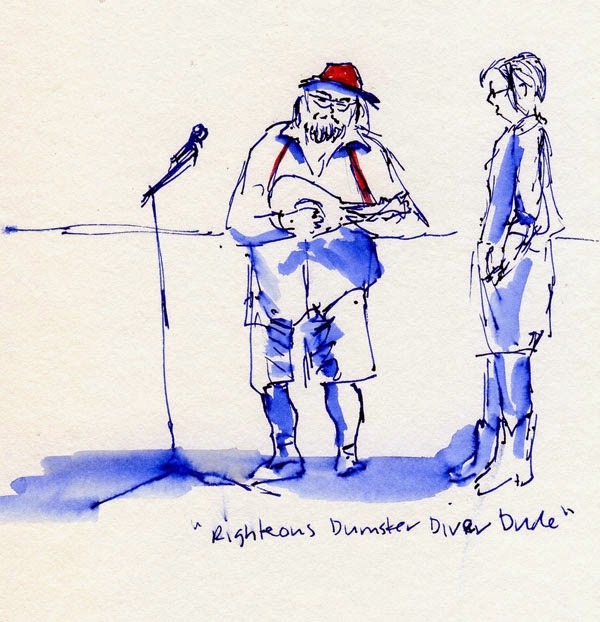 As I sketched it, I had one of the strangest public sketching encounters yet. A man took out his phone and said, “Would you like me to take a photo of it for you?” assuming that I was sketching it because I had no camera! 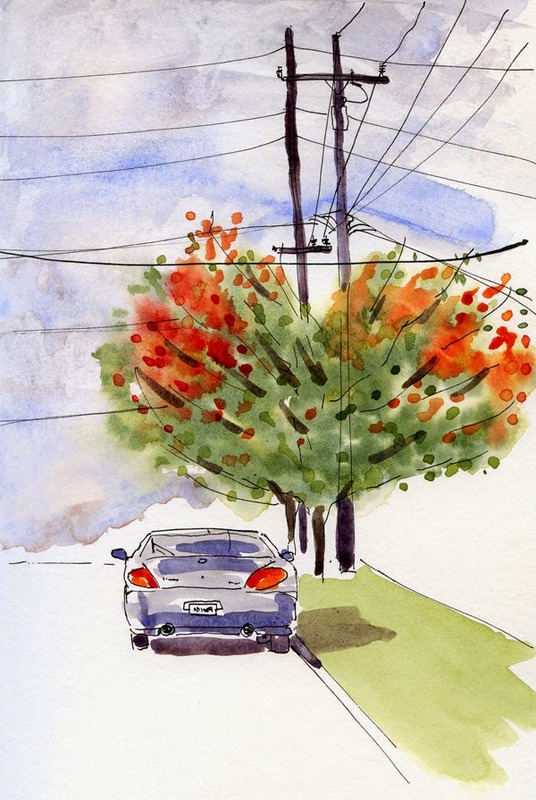 Last fall and winter I did a series of sketches of trees that had been mutilated to accommodate power lines. 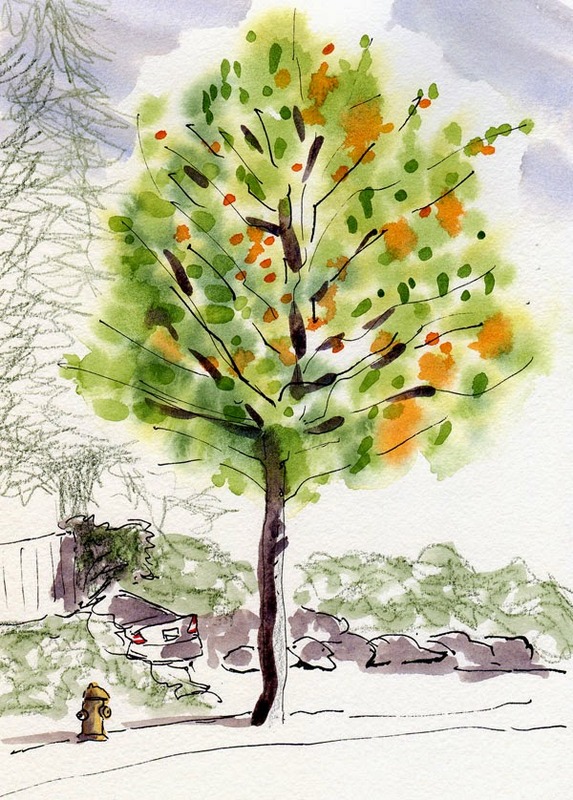 And every fall and spring I sketch plenty of “portraits” of trees wearing their seasonal colors. This afternoon as I drove home from an appointment in Ballard, I spotted a maple that qualified for both themes. Still more green than red, this tree wasn’t too badly hacked up for the power lines running down Northwest 85th. The last time I hit two themes in one sketch was last spring with a couple of blossoming cherries. It’s a sad day in September when rain finally keeps an urban sketcher indoors for the first time in literally months (according to KOMOnews.com’s weather blog, Seattle nearly broke a record from June 21 through Sept. 21 with an average high temperature of 79 degrees – the second hottest summer since 1945). 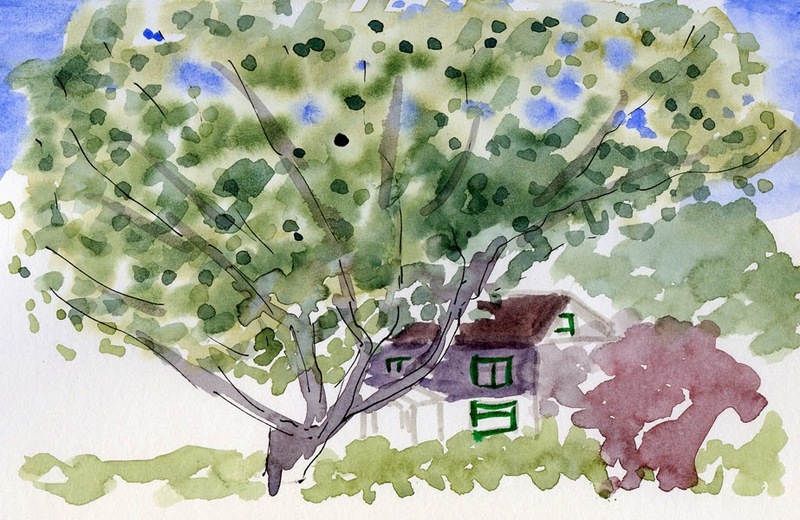 I’m not complaining – it was an incredibly beautiful sketching summer – but it’s still sad to see it end. 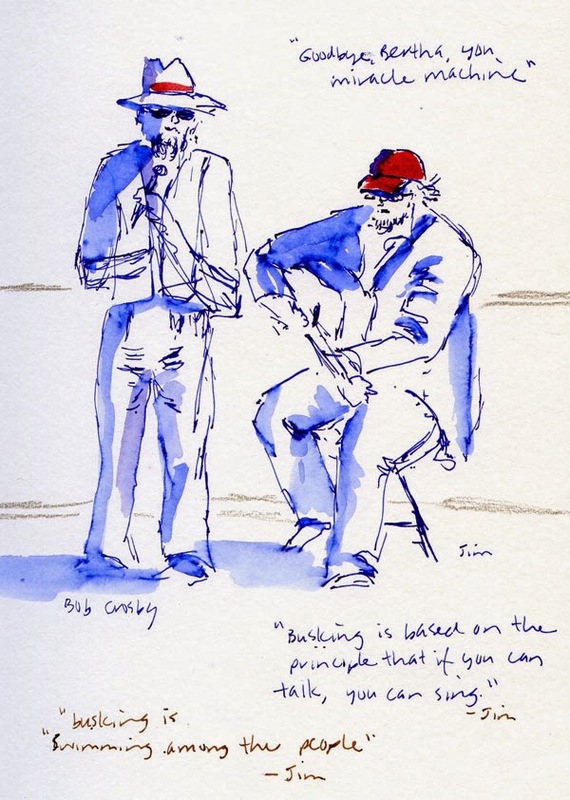 At the Urban Sketching Symposium last month, I heard a lot of talk about going straight to watercolor with a sketch instead of making a line drawing first. Unfortunately, I missed Behzad Bagheri’s workshop and Kumi Matsukawa’s demo on the subject. But fortunately, I found a huge peach (yes, we still have fresh local peaches! 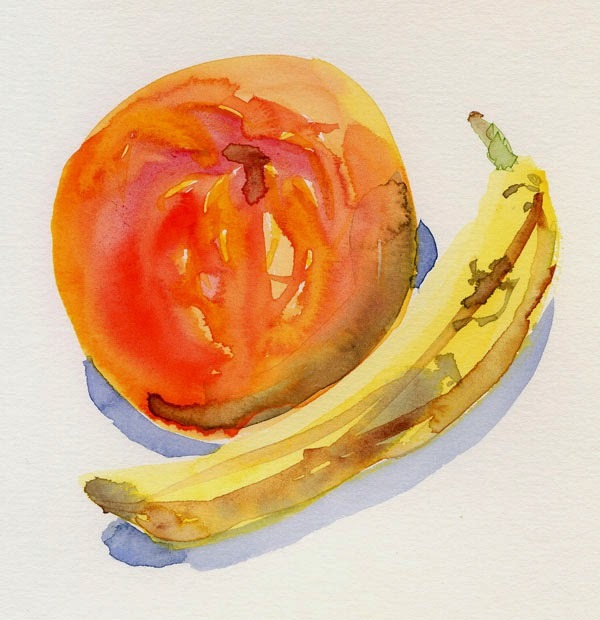 Surely an outcome of all that sunshine) and a banana on the counter asking to be painted. Technical note: I usually prefer white paper for watercolors and sketching in general. 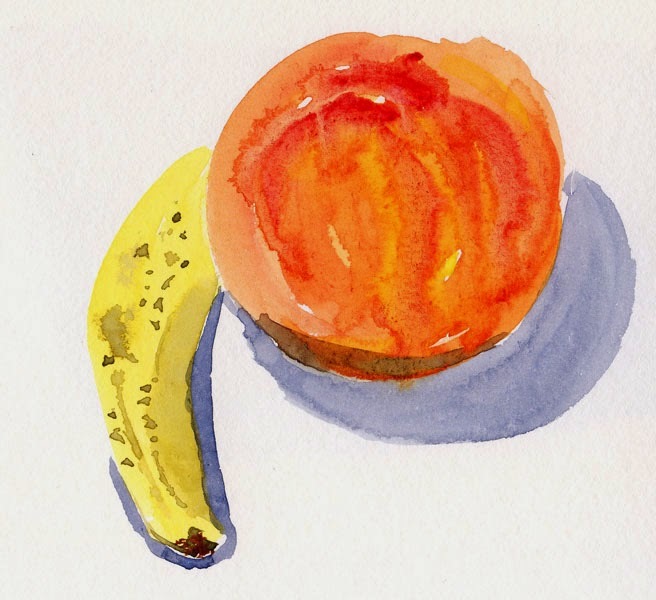 For two of these still lifes, I used my Stillman & Birn Delta book, which has a creamy ivory color. It might not be apparent in the scans, but I sure like the way the warm fruit hues came out on that Delta paper. The white Beta paper in the second still life gives the sketch a cooler tone. The same Van Gogh paints were used for all three. 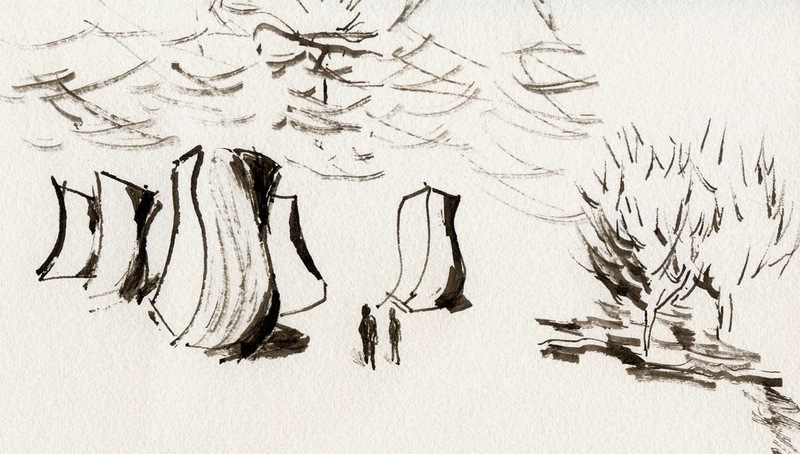 Yesterday’s monochromatic experiments at the sculpture park were both fun and informative, and I’m definitely going to do more sketches with twigs and sumi. But today I needed a color fix. On my way to the grocery store, this tree in the Wedgwood neighborhood caught my eye. 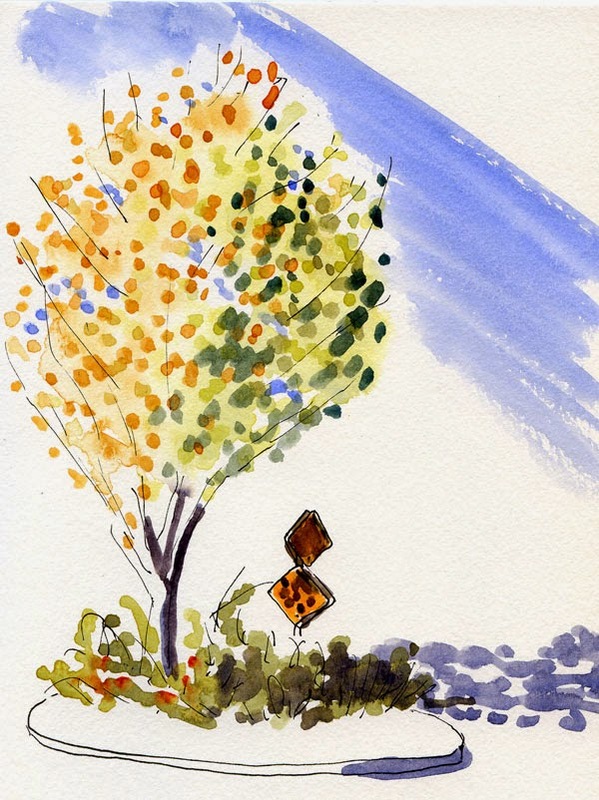 It’s just barely getting started with fall – perhaps even a bit reluctantly. We’ve all heard of the proverbial artist who can create a masterpiece using only a toothpick and ketchup. I haven’t seen a demo using those media yet, but the one I saw in Paraty last month came close: Ch’ng Kiah Kiean (better known as KK) wielding a twig and Chinese ink. After his inspiring demo, I gave it a shot myself, vowing to try it again later at home. 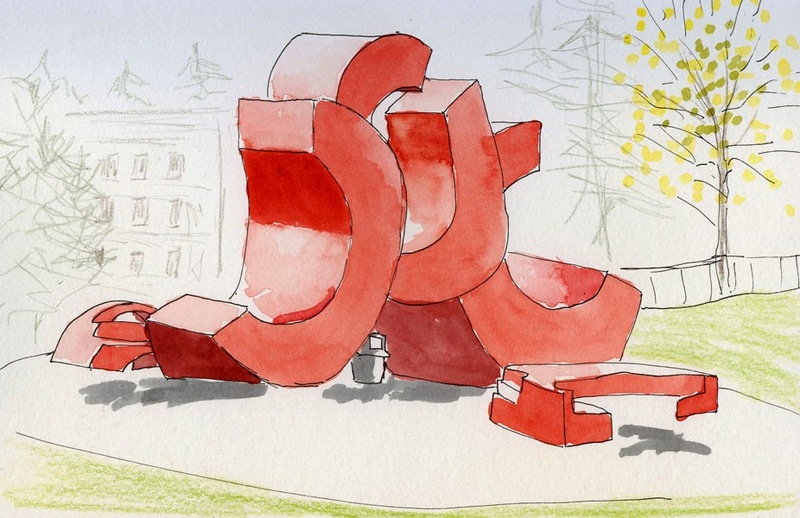 This sunny morning at the Olympic Sculpture Park, which got a huge turnout of Seattle Urban Sketchers, I had an opportunity to give my twig a better workout. Three years ago today, I started drawing. 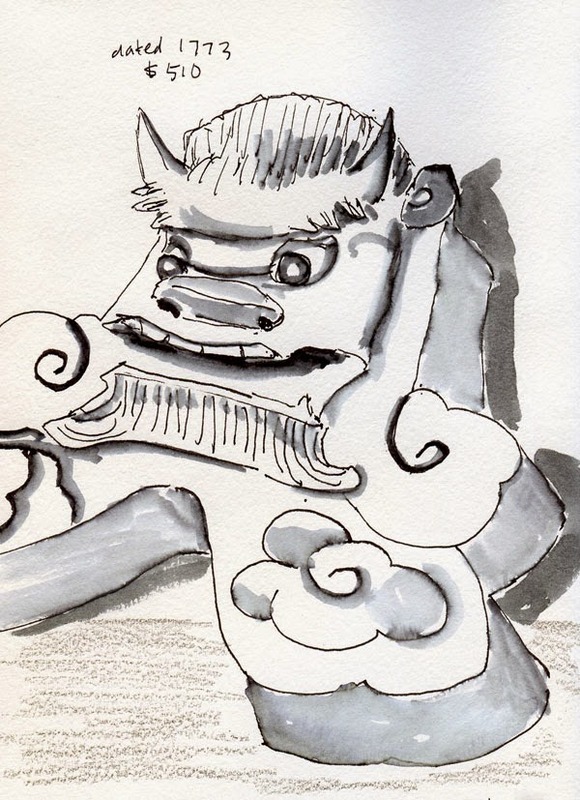 It’s become a personal tradition to write an introspective post on my drawing anniversary. I think it’s important to honor and celebrate something as important to me as sketching, especially since it was a part of me that lay dormant or repressed for most of my life. An anniversary is also a convenient annual retrospective of my progress and process. 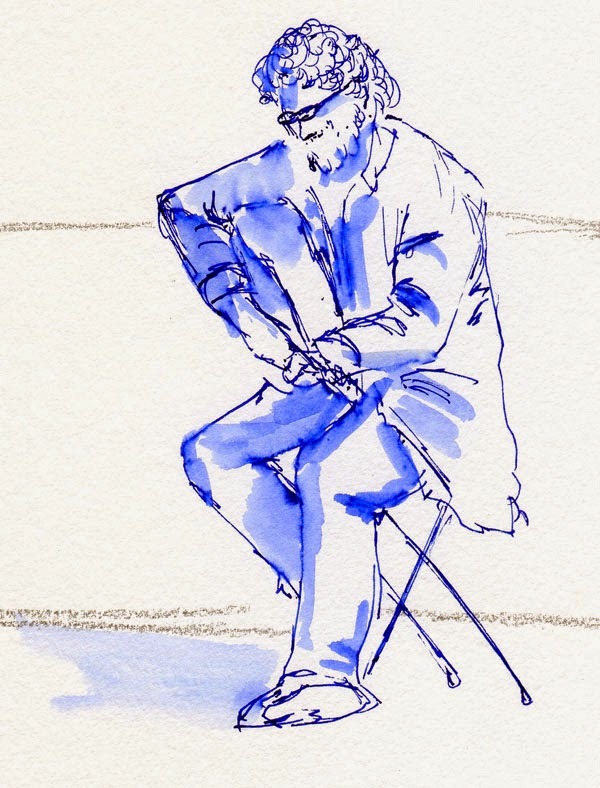 Today I’m still thinking about the excellent, inspiring post I read a few days ago by Alex Zonis, a Chicago urban sketcher, about “talent” versus persistence, tenacity and 10,000 hours of practice. (If you haven’t yet, go read her post now.) Although I still have many (I’ve estimated 9,000) hours yet to go before I reach the 10,000 I need to consider myself sufficiently well-practiced, I identify strongly with everything Alex wrote. At this point, the person’s expression changes from skepticism to dismay, and I assume they are doubtful that they could do it themselves. But I also think they are disappointed that I wasn’t born with this “talent,” because it means they can’t let themselves off the hook – “I wasn’t born that way, so I could never do that.” If what I just told them is true, it means they could draw, too – but they’d have to practice, and they don’t want to hear that part. My very first post on this blog was about the topic of regular practice, and it’s something I think about a lot. When I consider all the times prior to three years ago that I started learning to draw, and then eventually quit, I’m not sure what all the factors were that led to quitting, but I know that at least one of them was that I got bored with the subject matter I practiced with. Whenever I took a drawing class, the subject matter was inevitably something suited to classroom studio teaching, such as still lifes or piles of cubes and spheres. Drawing books were the same. 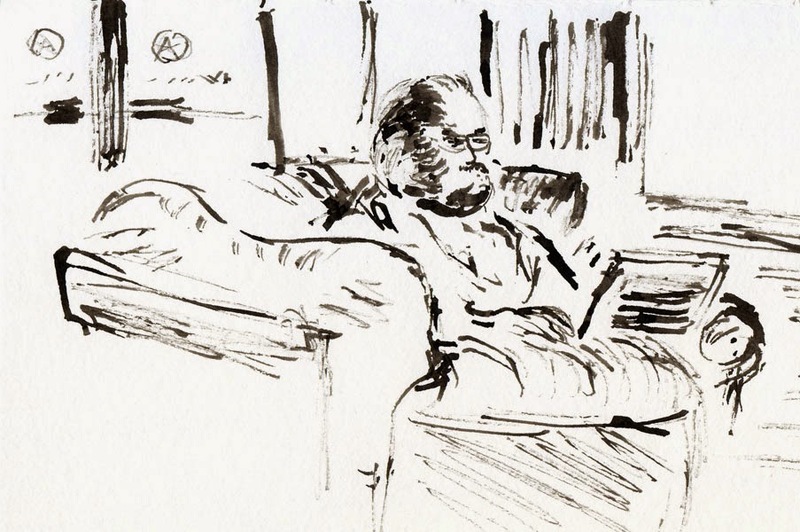 While I accepted that basic drawing principles are easiest to teach when using readily controlled subjects as these, and while I also knew that something of value can be found in anything I might draw, I could not get past the fact that these subjects did not resonate with me. I was well-intentioned – I didn’t mind working hard and practicing; I knew that to improve at anything requires practice – but I didn’t have the discipline to keep doing something that bored me. 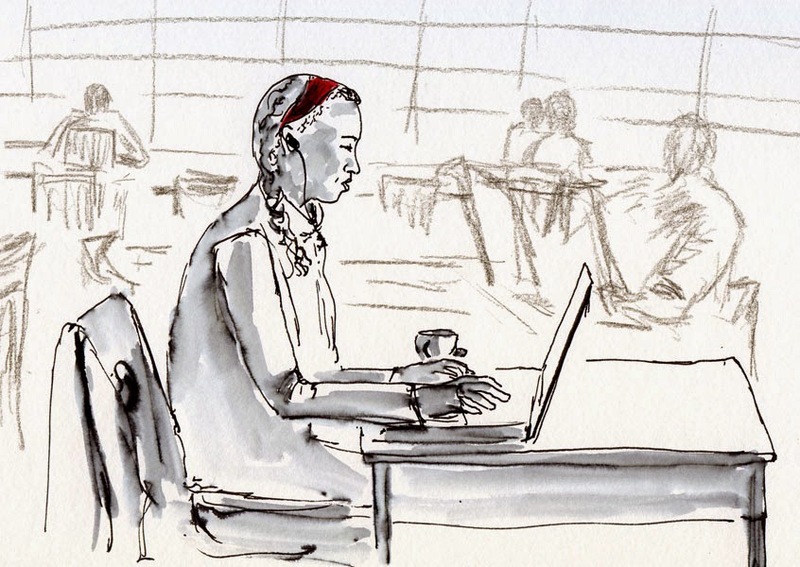 It wasn’t until I discovered urban sketching that I finally, finally, found subject matter that resonated meaningfully. I no longer felt like I “had to” practice; I felt compelled to. “Practice drawing” wasn’t something I checked off my to-do list; it was something I couldn’t wait to get out the door to do. 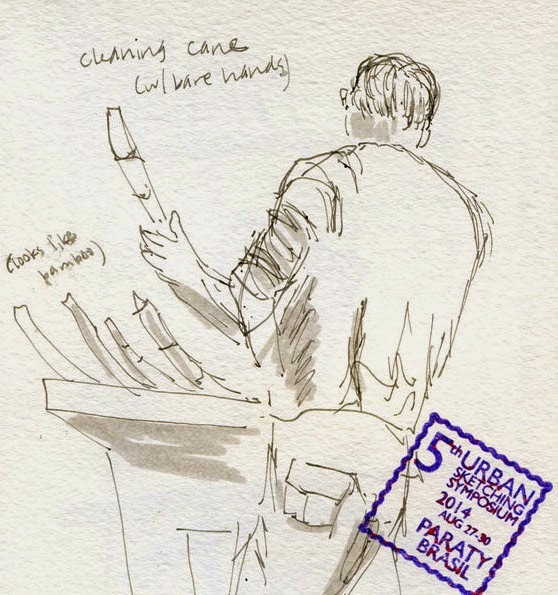 So this post today on my third anniversary isn’t about the virtues of urban sketching versus still lifes. It’s not a lecture about how you should draw more often. And it’s not even a list of suggestions for making regular practice easier. All I have to say is that if you want to get good at something and you don’t want to quit before your 10,000 hours are up, look for subject matter that resonates with you. After that, you will not feel forced to practice – you will feel compelled. And the 10,000 hours will take care of themselves. 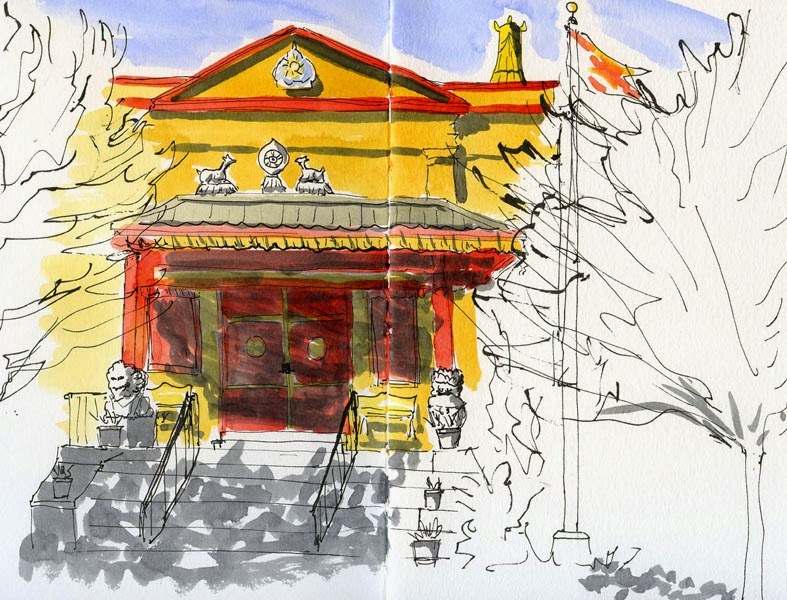 I know nothing about the Sakya Monastery of Tibetan Buddhism, which is on the corner of North 83rd and First Avenue Northwest in the Greenwood neighborhood. Sketching it today, however, taught me two things: Bright yellow and red must be symbolic, reverent colors for this Buddhist sect, so although I usually don’t pay much attention to getting the colors of buildings exactly right, I tried my best for accuracy in this case. The second thing I learned is that animals and nature must be important; two lions flank the stairway leading up to the ornate façade and doorway, and two deer are atop the front overhang. 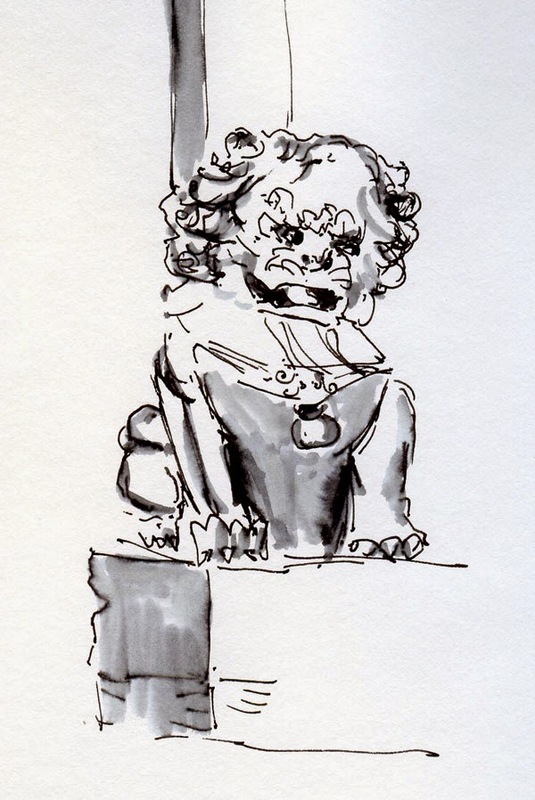 When I first spotted this monastery on my way to an appointment a few days ago, I had only five minutes to spare, so I quickly hopped out of the car to sketch one of the lions. Today on a sunny afternoon, I took my time with the colorful front. Not shown in my sketch is the whole right side of the building, where an elaborate percussion system stands exposed. At first I thought the cylindrical objects were bells, and I wondered how the monks kept neighborhood children (or adults) from ringing them at all hours. (I figured the clappers must be removable.) Today after school let out, a few kids walked by, and right on cue, they made a swing past the cylindrical objects. Instead of gonging them, however, the kids knew to spin the cylinders, which made a soft rattly sound, like they were filled with seeds or pebbles. I have to come back another day to sketch them. My Brazil travel sketchbook is bound. This rainy morning was a good opportunity to finish binding my Brazil sketchbook. 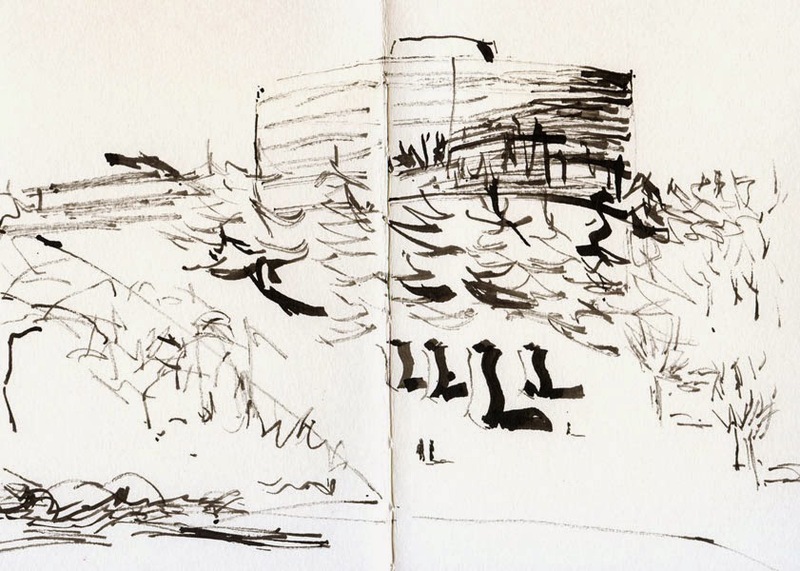 As with last year’s Spain/Germany sketchbook, I kept my symposium workshop and activities sketches in a separate collection from what I would call my “usual” travel sketches. 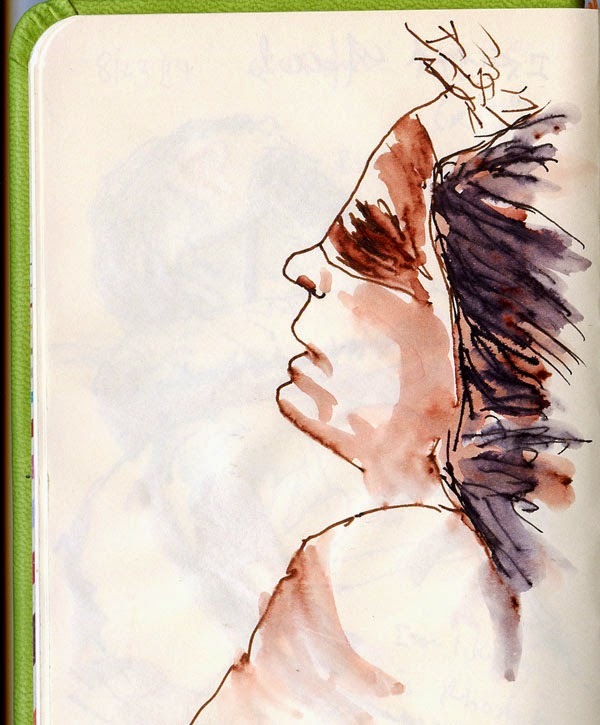 In fact, the symposium sketches all went into the Moleskine watercolor sketchbook that I received in my goodie bag. Even though I would normally prefer the chronological continuity of keeping everything in one sketchbook, I liked putting all my workshop sketches in one self-contained volume peppered with class notes, related ephemera and cards I exchanged with other sketchers. I bound the symposium program right into the sketchbook. I ended up filling seven signatures with non-symposium-related sketches. Like last year, as a symbol of the initial impetus for the trip, I bound the symposium program right into the sketchbook. So the eight total signatures turned into my thickest handbound sketchbook yet, which gave me a little concern about how well the stitching would fare, but I needn’t have worried. Coptic stitch is stronger than it looks (or perhaps my technique is improving). Creating the book covers was especially fun; it gave me a sense of closure on the trip (and also took care of a potential packratting issue). I pulled out all the maps, brochures and other ephemera collected during the two weeks. This is the kind of stuff I used to haul home, shove into a box, store in the attic and never look at again (until I throw it out a couple decades later). Now, after carefully selecting and preserving the most meaningful images on the covers, the rest goes into the recycle bin (right away!). 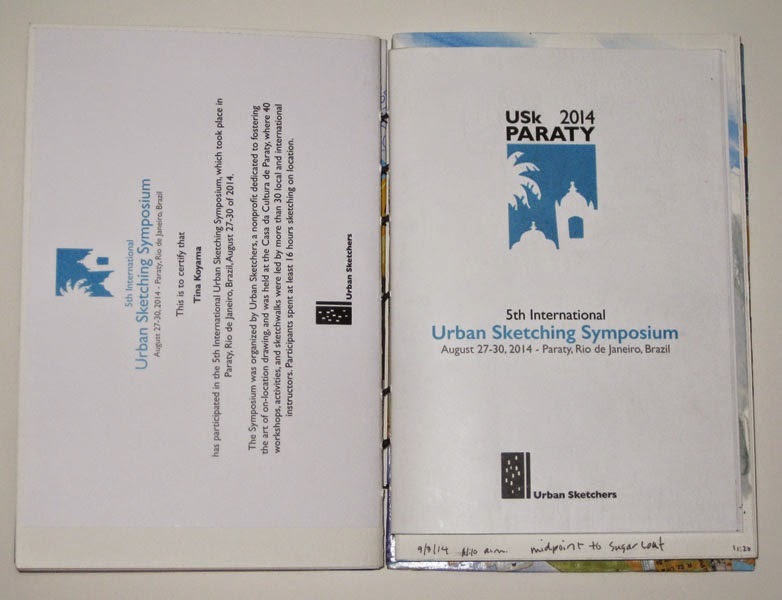 The front cover is a collage of images of Paraty and the symposium logo. 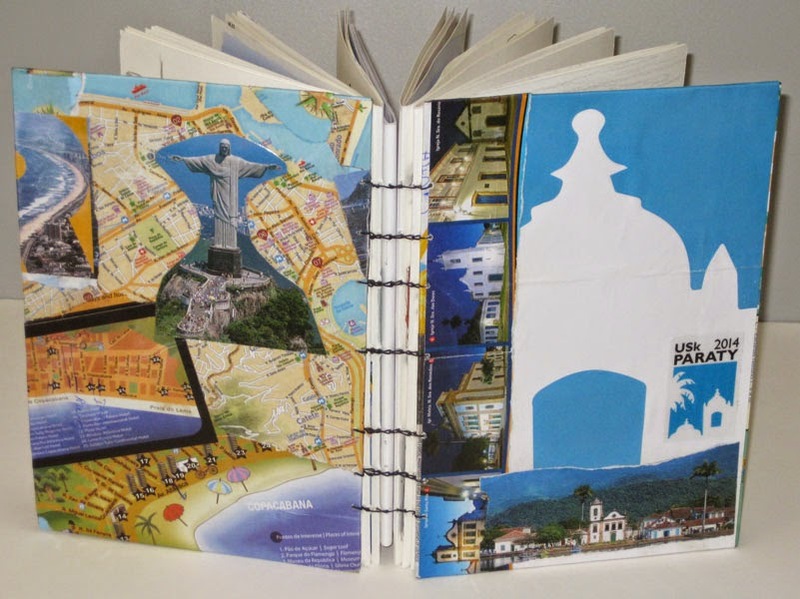 The back cover is made of map scraps and brochures of Rio, plus an image of the spectacular Cristo Redentor cut from a postcard. My July - August sketchbook covers remind me of a lovely summer. Last year’s symposium and related travels were my impetus for developing a flexible, portable sketchbook system that led to handbinding. Now, 14 handbound sketchbooks later (in as many months), I feel like I’ve completed one cycle – and look forward to the next one. When I first spotted the maple growing in this Greenwood neighborhood traffic circle from a few blocks away, I thought it was curious that one side was still completely green, while the other side was turning. Then I drove up closer and realized there were actually three maples (another curiosity: that’s a lot of trees for one traffic circle). Perhaps the arborist or gardener who planted this circle planned the varieties carefully to lengthen the time that the intersection of North 83rd and Dayton North would be glowing with color. I might come back in a month or so and see what it looks like then. 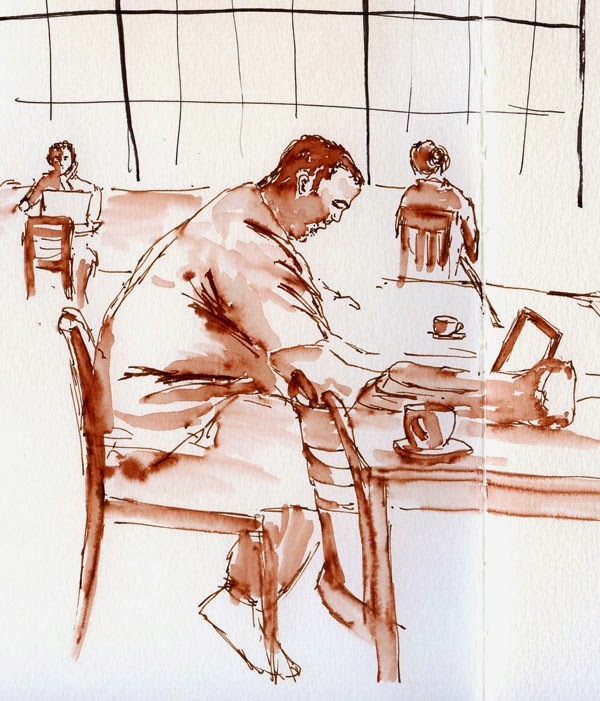 I just read an excellent, inspiring blog post by Alex Zonis of Urban Sketchers Chicago. Every word could have been stated by me (uh, well, except the part about having reached 10,000 hours)! After three years of sketching, I probably still have about 9,000 hours of practice to go, and I’m looking forward to every one. 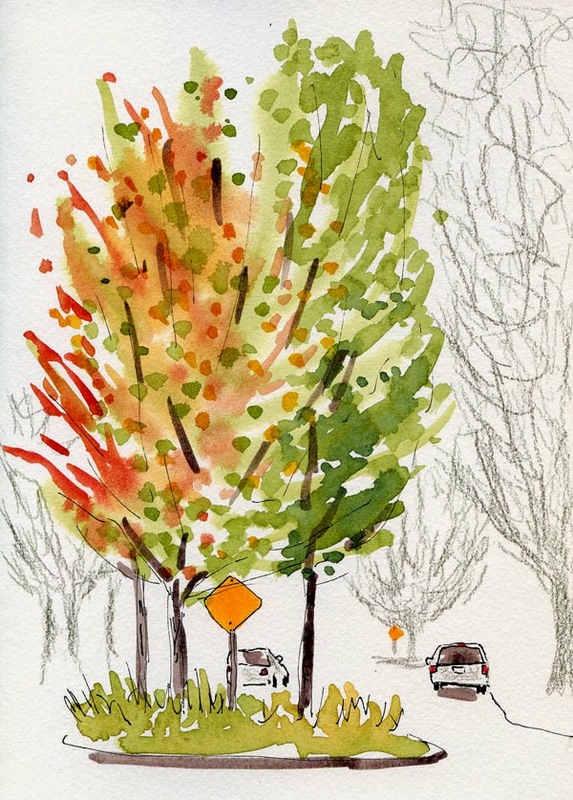 Since many of the maples near Green Lake are beginning to show color, I walked up to Maple Leaf Park to check on the huge sugar maple I sketched last April, wondering if it had started coloring, too. Not at all – it’s still fully green. Since it enables me to hang onto the illusion that we still have some summer left, I sketched it anyway. 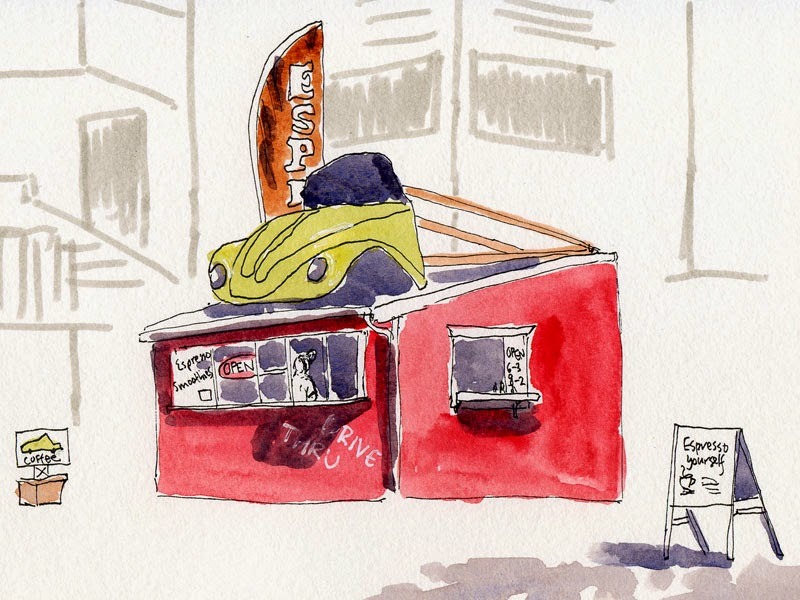 The Chevron gas station at the corner of Northeast 85th and Fifth Northeast has had an independent espresso stand on one side of its property for years. The caffeine biz is a difficult, competitive one. (During the half-hour that I took to make this sketch, the stand had one customer besides me.) If I’m filling my gas tank there, I sometimes get a coffee, and I’ve seen a recurring cycle of mood swings: At first there’s high enthusiasm and optimism, lots of fun marketing ideas and perky, hand-lettered signs. Gradually the hours shorten, the signs and smiles fade, and the next time I drive by, the stand has a new name. These cycles rarely last longer than a year – sometimes as short as a few months. I’ve occasionally considered sketching the stand whenever it changes hands, but the nondescript, shed-like structure hasn’t interested me much as a sketching subject. Until today. The latest rendition, Mug Bugs Coffee, has been open for two months, but only yesterday put up an eye-catching display: the front half of an actual VW Bug perched on top of the stand. The barista told me that the owner has another store in Kent, and when I Googled it, I discovered that the Kent store is adorned with the rear half of what looks like the same Bug. I don’t know how long this one will last, but the iced mocha tasted fine, and I give them bonus points for the Bug. 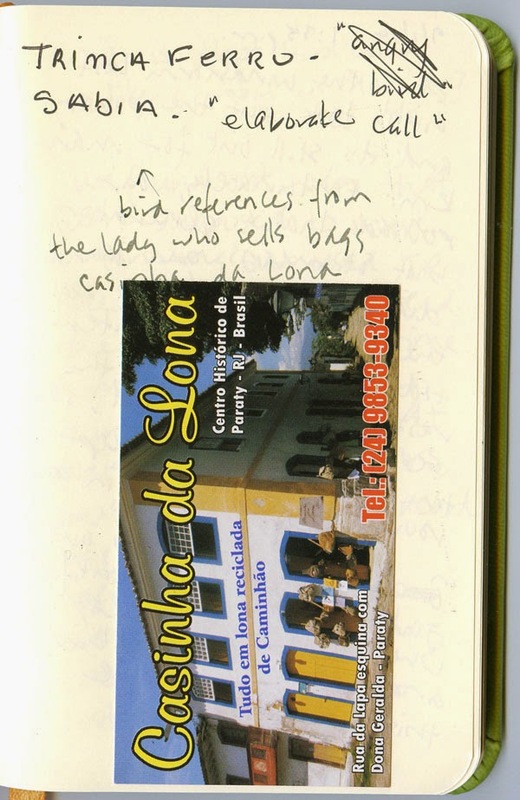 My travel journal in Brazil was a Rhodia Rhodiarama notebook. 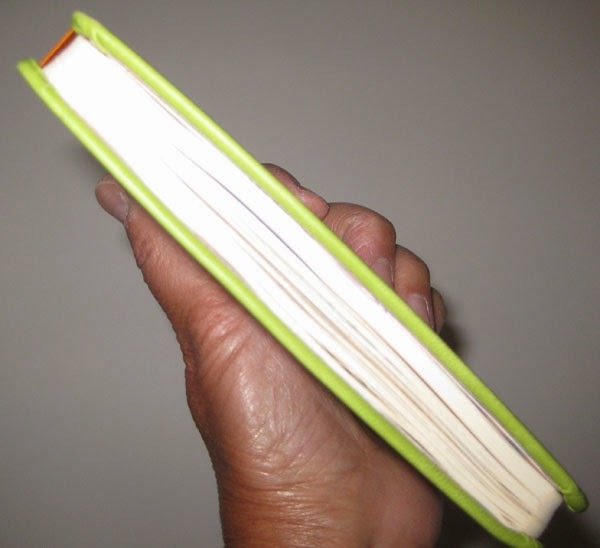 When I’m home, I keep an ongoing journal/log book using an A5 (about 5 ½” x 8 ½”) size Leuchtturm notebook. But when I do any major traveling (longer in duration than a few days), I switch to a pocket-size format. Aside from the practical matter of a smaller size being easier and lighter to carry, I also like keeping a separate, independent journal for each trip. I like to begin the travel notebook as soon as I commit to taking the trip because I want to document the whole process, not just the trip itself: the date I began applying for a visa; the purchase date and price of my airfare; the currency exchange rate. It’s also where I write key vocabulary words and phrases in the language of the country I’m visiting that I need to learn; the addresses of hotels we’re staying in (so I don’t have to dig that out of my carry-on bag when we’re sleep-deprived and bleary-eyed at the airport); our list of must-see sights. In other words, it becomes both a personal travel journal and a reference. When I wasn’t sketching yet, the type of paper wasn’t very important, so I most often used a Moleskine or other similar hardcover pocket-size notebook. 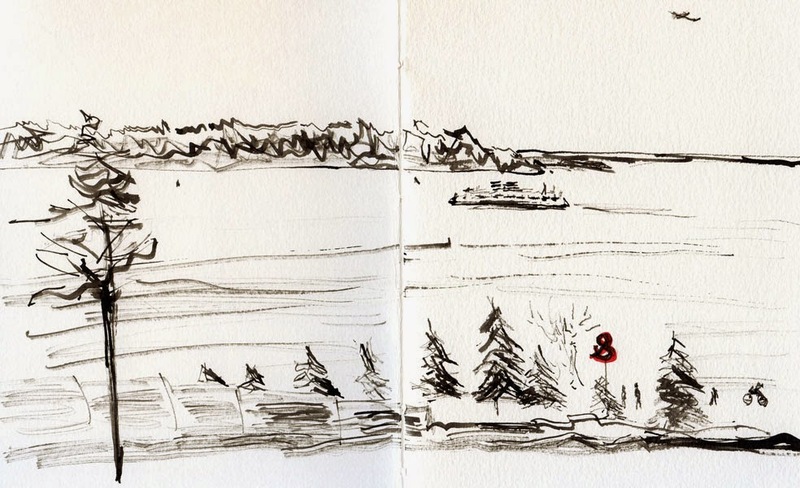 Last year I took a Pen & Ink notebook to Europe. It has smooth, heavy paper (similar to Moleskine’s manila-folder-like “sketchbook” paper) that I enjoyed writing on, but the binding started falling apart before the two-week trip was over. This year for our trip to Brazil, I gave a lot more consideration to the notebook itself than I usually do. I recalled a time in Barcelona last year when we were walking to dinner, and we ran into a commotion on La Rambla. I couldn’t read the signs that people were carrying, but I got the impression that it was some kind of protest. Since we were only going to dinner, I had left my sketchbook and supplies at the hotel. (HA! I’d never make that mistake again!) I couldn’t let this first-ever opportunity for sketch reportage slip away! I quickly pulled out my travel journal notebook and a Bic ballpoint from my purse and sketched. 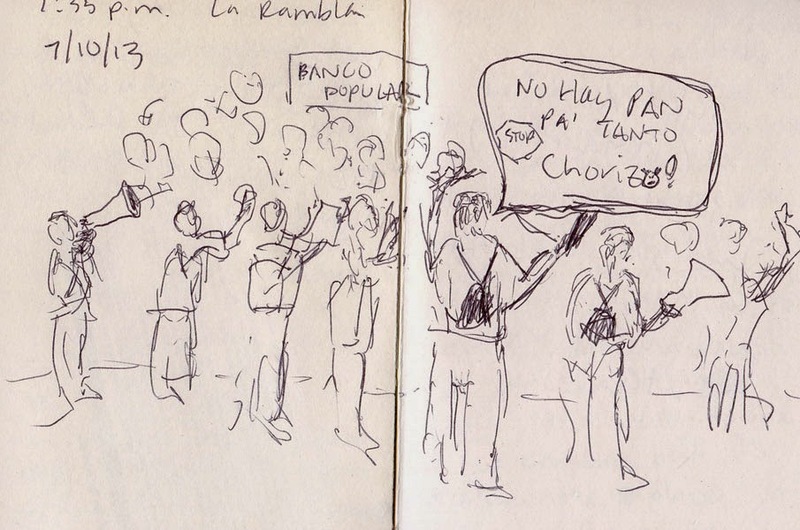 I never did find out what the protest was about, and the sketch didn’t convey much. 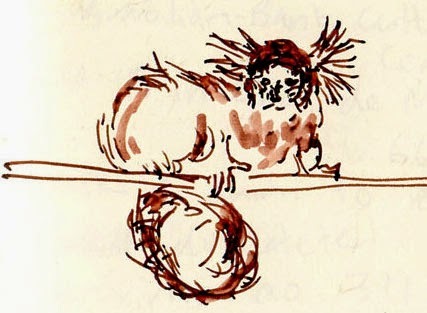 But the significant thing was that I realized the importance of always – always – having something in one’s possession to sketch on, even if only going to dinner. local shopkeeper about birds in Paraty. With that incident in mind, I set out to find a pocket-sized notebook that would be good for writing but could also take a sketch or two in a pinch. I’ve already tried quite a few commercial notebooks that I had hoped would fill this bill; my continual disappointment is what led me to make my own. For example, Moleskine’s pocket-size watercolor sketchbook is the right size and weight, but I hate writing on landscape-format pages, and I also prefer a smooth, nontoothy paper for writing. Moleskine’s standard notebook paper (and that of most competitors) is too thin and could never take even a light water-soluble ink wash. Moleskine’s so-called “sketchbook” paper (the yellowish manila type) is substantially thick (nice for collage), but I hate its waxy surface for sketching. I considered briefly making my own, but I didn’t think a handbound book with enough pages to last two weeks (I write a fair amount when traveling) would hold up well to daily-carry and general travel abuse. thicker than most notebooks in this format. 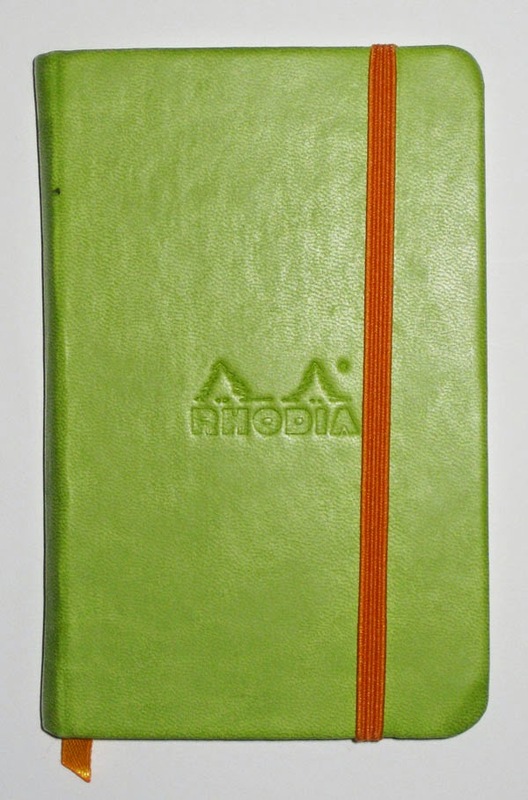 The one commercial notebook I hadn’t yet tried was the Rhodia. Much lauded by fountain pen users for its smooth, non-bleed-through paper, it’s more expensive than Moleskine and most other brands, and its thicker (albeit higher quality) covers and paper make it bulkier and heavier than Moleskines. 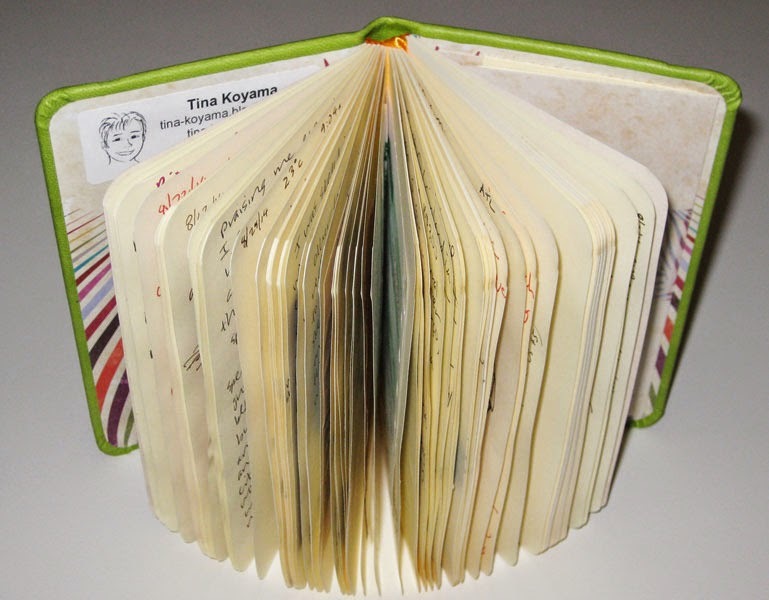 (It’s about three-quarters of an inch thick compared to Moleskine’s half inch.) With 192 pages (96 sheets), it also has more pages than I would normally use in two weeks. I bought one and gave it a quick water-soluble ink wash test, and the paper held up acceptably. Doubtful, I tried watercolor on it, too. It held up OK to the light wash, but the surface gave a flat, unpleasing look to the color, and the ivory tint isn’t very flattering to watercolor. Esthetically, the Rhodia’s cover and paper both feel wonderful to the touch, and the Rhodiarama series comes in a wide range of bright colors that appeal to me. But the Rhodia would definitely be a tradeoff of slim size for superior paper. I waffled quite a bit – my goal was to get my bag down to the lightest possible weight, and realistically, how often would I be sketching in my travel notebook, anyway? – but ultimately, the Rhodia won. And what a winner it is! First of all, the binding stayed strong, and I believe it could withstand months of daily-carry (though I’ll probably never test that myself; my travel endurance is about two weeks). The paper is a dream to use with fountain pen, cheap hotel ballpoint pen, pencil, rollerball, gel pen, you name it. Although I didn’t fill it, I ended up using more than two-thirds of it (maybe I’m getting more verbose). A monkey captured in my Rhodia notebook. Another example was on the outbound flight – the long, overnight leg between Atlanta and Rio. After a night of fitful dozing, I woke early when most other passengers were still asleep, including Greg. Bored, I wanted to sketch, but getting out my sketchbook would have meant digging around in my backpack, which was under the seat. Not wanting to wake Greg with my commotion, I simply pulled out the Rhodia, which was in the passport case around my neck, and entertained myself by sketching sleeping passengers in the near-dark. Would I consider using a Rhodia as my everyday catch-all sketchbook instead of a handbound sketchbooklet? After all, although the Rhodia’s paper isn’t as good as the 100-pound watercolor paper I use in my sketchbooklets, the type of sketches I end up doing in a sketchbooklet tend to be of bus commuters when I want to be surreptitious, so I wouldn’t haul out watercolors anyway. But the Rhodia’s biggest drawback is its bulk, which is about three or four times the thickness of a sketchbooklet. Still, it’s worth considering. And it’s definitely my notebook of choice when I travel. On our ride home from the airport Monday afternoon, the first thing I noticed was that the trees were no longer hinting at color as they were when we left town on Aug. 22; they were now making a statement: Fall is here. This aspen growing in a traffic circle a few blocks from our house was fully green when I left. 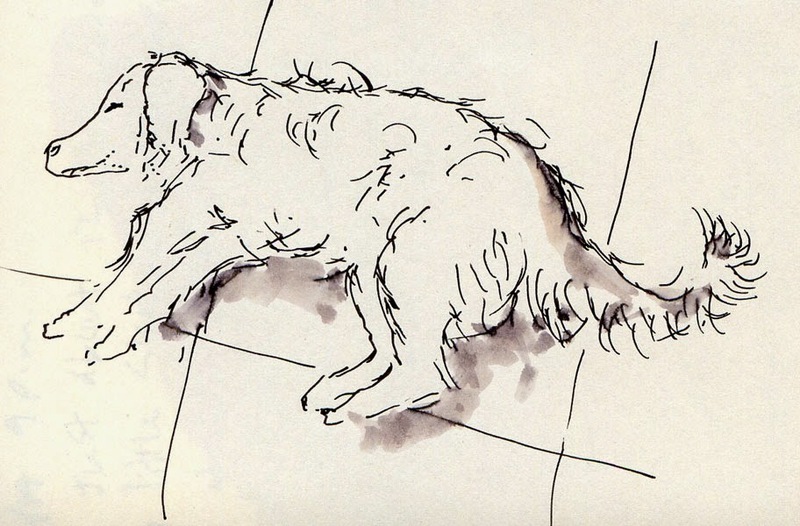 Today it looks at about the same stage as it was when I sketched it in October last year. Have the trees turned earlier this year? 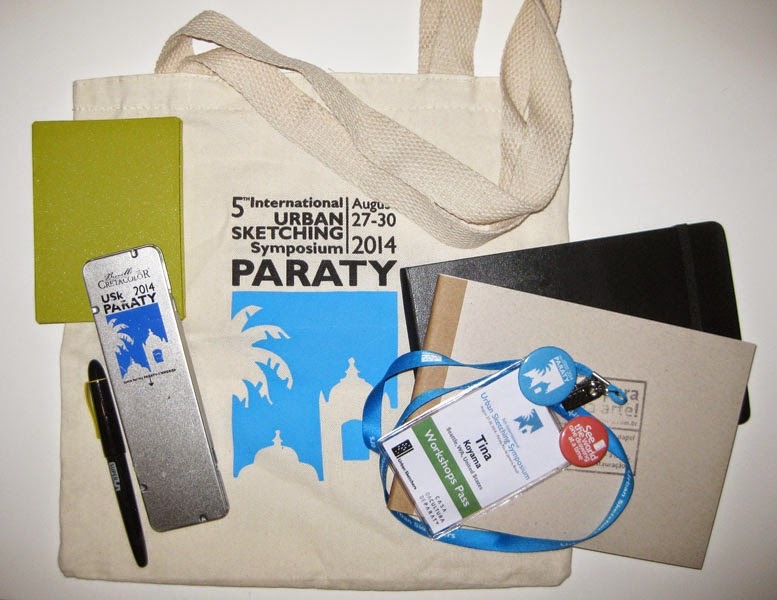 One of the gifts I received in my Urban Sketching Symposium swag bag this year was a Super 5 fountain pen. Made by a German company, the sponsorship was arranged by USk Development Director Omar Jaramillo, who helped fill all the pens individually during the symposium with the participant’s choice of ink. Apparently for many participants, it was the first fountain pen they had ever used. To evaluate it fairly, I have to use the pen for a while longer – I haven’t even used up the converter of ink I received in Paraty – but so far, I’m not overly impressed. It’s a bit heavier than I like (the body is plastic and metal), and the nib is sometimes skippy. Its idle time, especially, has been disappointing: Just a few days of nonuse renders it skippy. 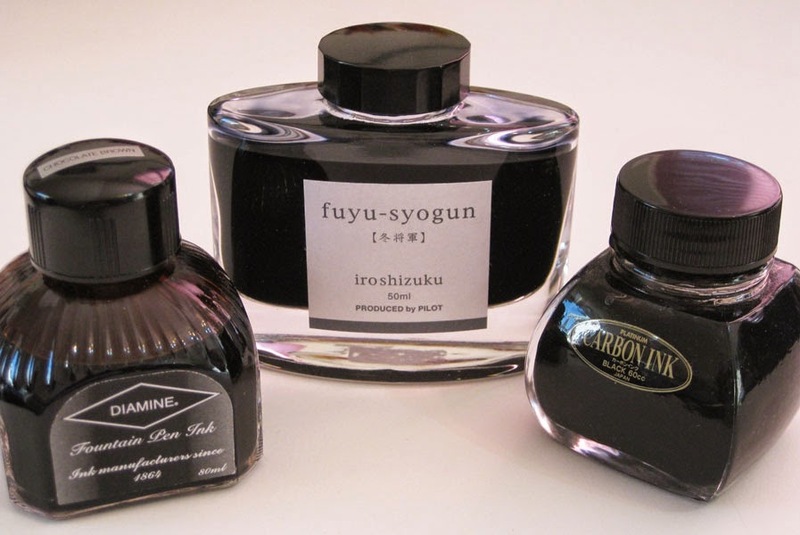 I’ve been looking for a waterproof brown ink for a long time. I’ve tried Platinum Sepia, but it’s too pale and reddish for my taste. (Don’t talk to me about Noodler’s inks . . . don’t even say the name if I’m in the room!) So this new Super 5 ink is verrrry interesting to me. When I inquired, Omar said that the company is quite new – its logo was still in development as the symposium was gearing up – so finding the ink in the U.S. might be a challenge. But you know me – I’m always up for a challenge, especially if it involves hunting down an art material. Stay tuned. Some of the swag I received at the symposium. 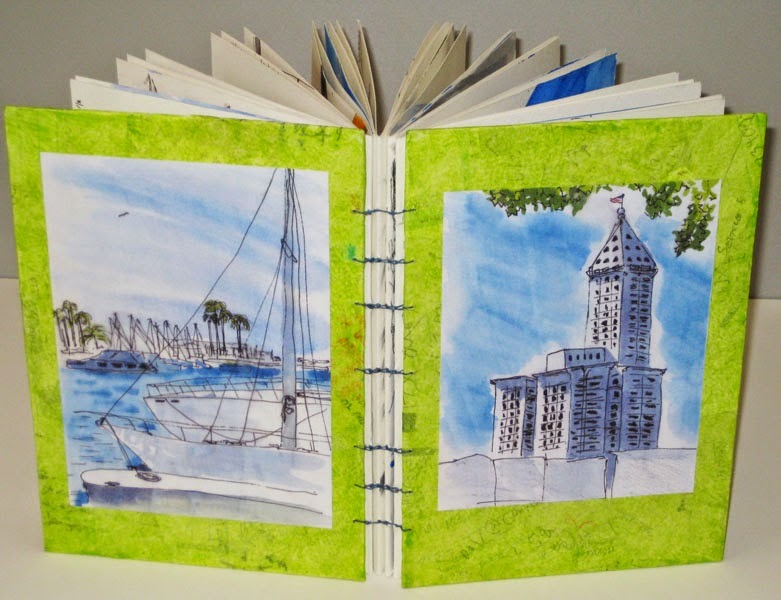 The Moleskine watercolor sketchbook is the “new” kind (the one that watercolor divas like Liz Steel and Shari Blaukopf are looking askance at), and I used it for almost all my symposium workshops and activities. 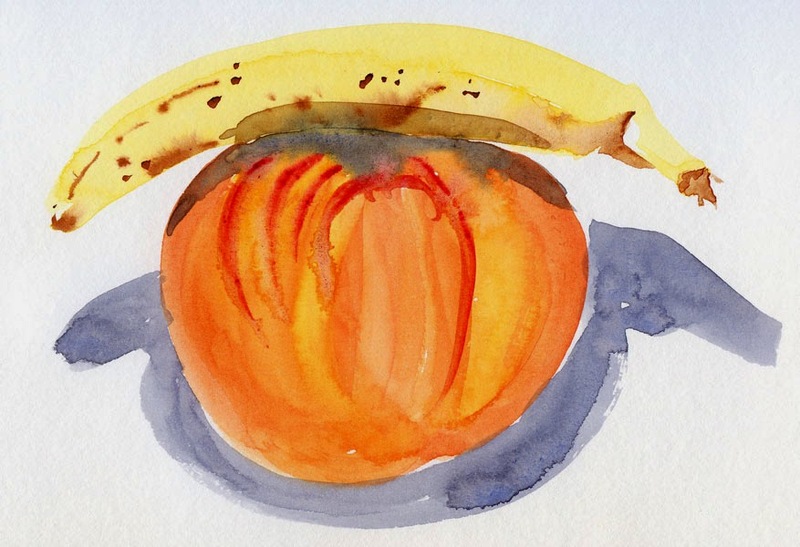 My watercolor painting skills are such that the paper made no difference to me – I’m sure I could live with it. My complaint is with the landscape format, which I hardly ever have use for (although the linear, process-driven aspect of Simo’s workshop actually made good use of the format). The second item worth noting is the small lime green book at upper left. Handmade by Laloran, it’s a beautifully crafted, Japanese-style, accordion-folded sketchbook with a very subtle impressed Paraty symposium logo on the cover. It was delivered later than the rest of the swag (I visualized the artisan frantically assembling all of them on her kitchen table the night before, trying to get hundreds of them done in time! ), and I didn’t get mine until the symposium was over, so unfortunately, I didn’t get to fill it with any symposium sketches. But I wanted to mention it because it was so delightful to see a handmade book among the swag! Edited 12/3/14: Ayumi (below in comments) just let me know that the inks are now available at GouletPens.com. Goulet is also carrying Super5 fountain pens.